Eastern Polynesians, traveling thousands of miles in large double-hulled canoes, began settling the North Island of New Zealand by about 1300. One of the first canoes was Te Arawa, and the Ngati Tuwharetoa — one of the iwi (tribes) that populated the area around Tongariro — holds ancestral identification with Ngatoroirangi, high priest and navigator of that canoe. Legend links Ngatoroirangi with the creation of volcanoes and the naming of Tongariro. According to one version, the priest traveled inland to explore the island and claim land for his people. As he climbed to the summit of Tongariro, a strong south wind brought extremely cold weather. Nearly chilled to death and exhausted by the climb, Ngatoroirangi called out for help from his sisters in the far-away Maori homeland, Hawaiki. They came to him in the form of fire under the earth, leaving a trail of geysers and volcanoes in their path and emerging at Tongariro to warm the priest. Thus, the volcanic landscape represents a genealogic link with the historic homeland of Hawaiki, and the mountains are revered as tribal ancestors. The name Tongariro — tonga (south wind) and riro (seized) — commemorates the cold wind that almost killed Ngatoroirangi. Pakeha (non-Maori people) began settling in New Zealand at the end of the 18th century. In the late 1800s, as European settlement increased, Te Heuheu Tukino IV, chief of the Ngati Tuwharetoa, feared that his sacred land would be divvied up and parceled out. But he had a solution: On September 23, 1887, he gave the peaks of Tongariro, Ruapehu and Ngauruhoe to the Crown and the people of New Zealand, on condition that the land become a protected area. The Tongariro National Park Bill was passed into law in October 1894 — making Tongariro the first national park in New Zealand, the fourth in the world, and the first ever to be gifted by a country’s indigenous people. The original gifted region consisted only of the upper areas of the volcanic cones, but over the years the park borders were expanded to protect some 300 square miles. Located at the southwestern end of the Pacific Ring of Fire, Ruapehu and Ngauruhoe are two of the world’s most active composite volcanoes. Ruapehu, at 9,174 feet, is the tallest mountain on the North Island; Ngauruhoe, the youngest of the three, stands at 7,515 feet, while Tongariro is 6,487 feet tall. The parkland is incredibly diverse, including glaciers and winter snowfields, barren lava flows, herb fields, forests, green mineral lakes and geysers. Tongariro National Park was inscribed on the UNESCO World Heritage List in 1990 solely on the basis of its natural and environmental values and without regard for its vital sacred significance to the Maori population. However, in 1993, with urging from the Maori people, Tongariro was renominated for its value as an “associative cultural landscape” — a new category that the World Heritage Committee adopted in 1992 to recognize sites that possess “powerful religious, artistic or cultural associations of the natural element rather than material cultural evidence, which may be insignificant or even absent.” Thus, a mountain could be recognized for its sacred value to a culture just as cathedrals already were. This acknowledgement of the interconnectedness of culture and nature — a so-called “intangible heritage” — has led to many more sacred sites around the globe receiving the special World Heritage designation. Like many other indigenous sacred places worldwide, Tongariro National Park faces the flattering threat of being “loved to death” as increasing numbers of visitors — currently about one million each year — come to partake of its natural beauty and recreation opportunities. Skiiers have been enjoying the slopes of the park since the early 1900s, and hiking, biking, camping and mountaineering are other big recreational draws. But these activities require facilities and infrastructure, hence the park contains roads, parking lots, trails, ski lifts, viewing platforms and trekking huts. Unlike many national parks, Tongariro has a village within it. Whakapapa Village, which provides lodging and amenities, was established early in the park’s history, before ideas about conservation shifted to discourage such practices. The primary problems created by the large numbers of visitors to the park are high quantities of garbage, erosion caused by hikers taking shortcuts between trails, pollution from heavy car traffic, and an overburdened and outdated sewage system that releases low-quality waste water into streams. There is also concern about the growth of nonnative plant species, possibly brought in by foreign materials used in roads and parking lots. In addition, the active volcanic nature of the park poses threats to public safety. Nevertheless, because of the management system in place, which actively incorporates Maori concerns and emphasizes preservation of the World Heritage values that enabled the park’s designation, these challenges are not insurmountable. The New Zealand Department of Conservation manages the park and a Conservation Board prepares the Tongariro Park Management Plan, which was reviewed in 2003. The Maori tribes of the Tongariro region — the Ngati Rangi, Ngati Tuwharetoa and Ngati Tahu iwi — are consulted on all significant management issues within the park, especially where cultural values are involved, and there are several Maori members on the Conservation Board. The current Park Management Plan prohibits extension of the amenity areas — Whakapapa Village, the commercial ski fields and a smaller ski village — and defines what development can take place within those areas. For example, no further accommodations can be built within amenity areas, and ski fields are restricted to three percent of the total area of the park. Outside the amenity areas, priority is being placed on restoring hiking trails, and all toilets are being converted to ecologically friendly dry-vault toilets. There are two small wilderness areas ensuring that parts of the park are free from any sort of facilities. 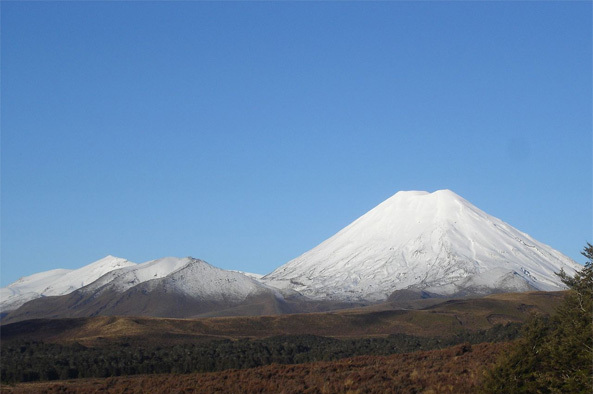 New considerations from the 2003 review include implementing measures to limit visitor numbers on Mount Tongariro, new sewage treatment efforts, limiting the impact of aircraft and commercial filming, and whether to permit commercial guiding. The issue of commercialization in the park is of particular concern to Maori tribes. Additional outside recommendations include moving parking and accommodation facilities outside the park and providing bus service into the park, trucking and disposing of all sewage outside of the park, and encouraging ecotourism operations. With so much tradition, history and culture tied to the mountain, the Maori want to see these values, as well as the park’s physical integrity, preserved for future generations. Since the designation of Tongariro National Park as a cultural landscape, awareness and understanding of Maori cultural values have increased. Maori have been involved in the redevelopment and creation of new displays at the visitor centers that explain the cultural and natural significance of the park and help foster respect for its careful management and conservation. They have also taken part in planning World Heritage celebrations, developing education resources and biodiversity programs, and assessing concession applications. A good example of the collaboration between park management and local Maori tribes is the handling of a safety threat after a series of volcanic eruptions in 1995 and 1996 emptied Mount Ruapehu’s Crater Lake and built an accumulation of ash deposits at the lake’s outlet. Because of the threat of a volcanic mudflow once the lake refilled, the Department of Conservation undertook an environmental and cultural assessment, in consultation with local tribes, of the options to minimize risks to public safety. One option, which entailed bulldozing a trench into the summit of the mountain, was opposed by the local tribes, who felt it would “challenge the indigenous integrity and strength of the cultural World Heritage status.” The conservation minister decided against such work and instead opted to install a state-of-the-art alarm and warning system and construct a protective bank along the Whangaehu River to prevent a mudflow from overflowing onto the highway — a decision that received commendation from the World Heritage Committee for its ethical and cultural sensitivity. If you visit Tongariro National Park, take care to learn and respect the ethics of ecotourism. Read Ethics for Visiting Sacred Sites for some ideas. Groot, Rachel. “The Tongariro National Park: Are We Loving it to Death?” New Zealand Journal of Geography, April 2003. New Zealand Department of Conservation. “Tongariro National Park.” Department of Conservation. New Zealand Ministry for Culture and Heritage. Te Ara, The Encyclopedia of New Zealand. Potton, Craig. Tongariro: A Sacred Gift. Lansdowne Press, 1987. Tongariro Conservation Board. Tongariro National Park: A Gift to the People of New Zealand (Draft Tongariro National Park Management Plan). Janauary 2003. United Nations Educational, Scientific and Cultural Organization. “Tongariro National Park.” UNESCO World Heritage Center.